Kratom is a mystery wrapped in an enigma wrapped in a gelatin capsule. Although I've purchased it, eaten it, and interviewed a kratom importer and an addiction specialist about it, I still don't know how to pronounce it. Then there's the question of what kratom actually does. It can speed you up or wind you down, depending on the dose and strain. It can be a gateway drug to opioids or a way to wean yourself off them. In short, kratom's effects are just about as varied as its users themselves. The one thing we're pretty sure of is that it won't make you eat your neighbor's face -- also, that kratom use is supposedly "booming," thanks in part to its mostly legal status. With that in mind, let's learn more about the latest way to get high on something you can order from the internet. "Kratom is a plant from Southeast Asia that has become increasingly popular in the West over the past 10 years," says Andrew, a kratom user and importer for The Kratom Connection. "It's a member of the coffee family and is well known for both its painkilling properties and its energizing properties." The leaves come in red, white, and green strains, he says -- red ones have sedative and painkilling properties, white are more energizing, and green strains are somewhere in between. "Although kratom is not an opiate, it works on the same receptors as opioids," says Clare Waismann, an addiction specialist at the Waismann Method. In Thailand, where the psychoactive herb is illegal, users most often chew its leaves raw -- in the US, where it's banned in six states, users take the ground-up leaf in pill, capsule, or powder form, often boiling the latter into a tea. Side effects include nausea, vomiting, sweating, itching, psychotic episodes, liver damage, and, in some rare cases, death. Sounds like a fun Friday night! It's also "very addictive," Waismann adds. Unless you're using it to wash yourself, presumably -- kratom is also an ingredient in some hippie soaps. I don't know, maybe because it's a cheap, legal high that won't show up on a drug test, and because altering your consciousness is fun? Or because it's a cheaper way to treat chronic pain, which has been helping to fuel the painkiller crisis you can't stop hearing about. 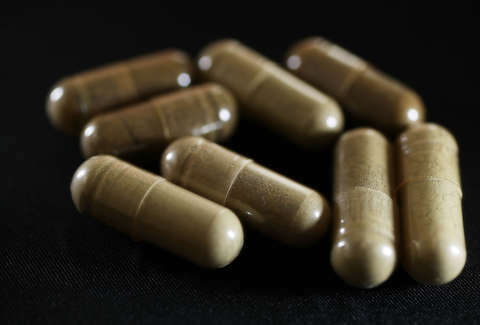 "It's an inexpensive alternative to painkilling prescriptions and for many people, it's been a lifesaver," according to Andrew, who, it should be noted, has some skin in this kratom game. Some people use kratom to wean themselves off opioids. However, Waismann says that plan often backfires. How could ordering a drug off the internet to help you stop taking a different drug go wrong?! The problem is serious, though: dozens of Waismann's patients switched from opioids to kratom -- then, when they found themselves dependent on kratom, they went back to opioids. "Once they see the withdrawal from kratom is very similar [to opioid withdrawal], they go back to their drug of choice," she says. "It's easier to get heroin than the amount of kratom they need." What is kratom withdrawal like? "Insomnia, nausea, sweating, muscle aches, extreme anxiety," Waismann says. "They describe it as feeling like your bones are going to crawl out of your skin." Are you sold? I'm sold. "Within an hour, I felt mellow, kind of the way I would after a few glasses of Two Buck Chuck -- yet mentally lucid." I live in New Orleans, where kratom is legal, just like drive-thru daiquiri shops. It's a beautiful place. I went to my local head shop and inspected its kratom menu, which has peppy, colorful fonts describing "house blends," loose powders, and capsules with names like Bali, Borneo, and Malay, as well as "OPMs" (organically purified mitragyna speciosa extract). It was all a bit overwhelming, so I asked the guy behind the counter for help. "How many should I take? Should I eat beforehand?" I asked, all too aware that I sounded like a n00b. "Have you done many opiates?" he asked casually, the way someone at a fast-food chain might ask if you'd like fries with your order. "Some, but it's been a long time." "Try seven or eight capsules," he advised. I looked at the horse vitamin-sized pills. That sounded like a lot. "Where do you get this stuff, anyway?" He said he couldn't reveal his sources. "It took me six months to track these down," he said, adding that bunk kratom is rampant online, but this stuff was the real deal. That night, I swallowed two 7.5g capsules of Malay, but I was already a few bowls deep, so it was hard to tell what was actually going on. I thought I felt something, though. A few days later, I swallowed six Bali capsules. Fewer than the guy at the head shop recommended, but I wasn't trying to trigger a spell of nausea or a psychotic episode. Within an hour, I felt mellow, kind of the way I would after a few glasses of Two Buck Chuck -- yet mentally lucid. Reruns of Beverly Hills: 90210 sucked me in, but I didn't forget to move for hours, like I might with opiates, and I didn't contemplate my mortality when faced with the crop top-heavy specter of my adolescence, as I might with some strains of sativa. I wasn't totally sure, but I thought my face felt more springy and taut than usual, like rubber bands were pulling my skin. I didn't like it that much, and now I have a bunch of baggies of kratom capsules in my kitchen cabinets that I'm never going to use. In our interview, Waismann told me, "We don't need any more mood-altering drugs. We have enough of those here already." I agree. Especially when they're just not that great. Missy Wilkinson will give you her unwanted kratom. Seriously, please take her unwanted kratom. Follow her on Twitter at @missy_wilkinson.